A recent, memorable drive was our visit to Fort Ancient on the Miami River valley. The Fort Ancient State Memorial is on the National Register of Historic Places, due to its importance in telling the story of Native cultures in America. The site contains original earthen mounds and a plateau enclosed by large "embankment walls" built by Hopewell Indians. According to the museum website, "The Hopewell, known for their engineering expertise, built these walls and many other features both within the enclosure and on the steep valleys that surround the site: conical and crescent-shaped mounds, limestone pavements and circles, and many subsurface elements that are currently coming to light.. . " Recently, the site was nominated for consideration to the UNESCO World Heritage list for its importance. Three sites in Ohio that have received nominations, among them Hopewell Ceremonial Earthworks, Serpent Mound and the Dayton Aviation Sites (Worldheritageohio.org, 2016), all worth visiting. There is a trail of ancient sites available here with more detailed information, for those who would like to see all of these types of sites from Ancient Ohio. The Hopewell lived from 200 BC to AD 500, along fertile rivers in the Northeast and Midwest, as the map below shows (Wikipedia, 2016). The mounds are part of the Woodland period and scientists believe they were used for ceremonials purposes (World Hertiage Ohio, Hopewell Ceremonial Earthworks, 2016). Walking these hiking trials and seeing the mounds up close, our family felt a connection to the history of these lands. These mounds provide a glimpse into the world of ancient civilizations that were so connected to the land, as a form of sustenance and reverence. The drive to Fort Ancient is beautiful in its own right, as it is located on the banks for the Miami River on winding roads and close to many zip-lining and kayaking areas. The natural habitat provokes a sense of peace and respect for people who lived thousands of years ago. The embankment walls are a cause of archaeological debate, as they are said have no defense relevance. The mounds are said to be of ceremonial importance. "The Fort Ancient Hilltop Enclosure is the largest and best-preserved structure of its kind in the world. Three miles of sinuous earthen embankments include 67 stone-lined gateways, and are accompanied by a continuous necklace of clay-lined ponds. Pairs of mounds create three distinctive monumental gateways; four other stone-covered mounds form a perfect square aligned to solar and lunar events"(World Hertiage Ohio, Hopewell Ceremonial Earthworks, 2016). Others believe they may have served dual purposes. According to AncientOhioTrail, "Professor Ken Tankersley of the University of Cincinnati has recently argued that the construction of these so-called “forts” had much to do with water management, and also that this design was more extensive than what was recorded on the best-known nineteenth-century map." Seeing the site up close, allows one to judge what they may have been used for. Our family walked by several sites where mounds where still evident in the landscape and others where man-made ponds once stood. Another similar Hopewell site worth noting, The Earthworks at Newark Ohio, "include the 1200-foot-diameter Great Circle with its steep inner ditch and monumental framed gateway, plus the Octagon Earthworks – a perfect circle and adjoining octagon over a half-mile across – whose perfectly formed, eye-level embankments align with all eight of the key rise- and set-points of the moon during its 18.6-year cycle, within a smaller margin of error than that at Stonehenge. . . "(World Heritage Ohio, 2016). 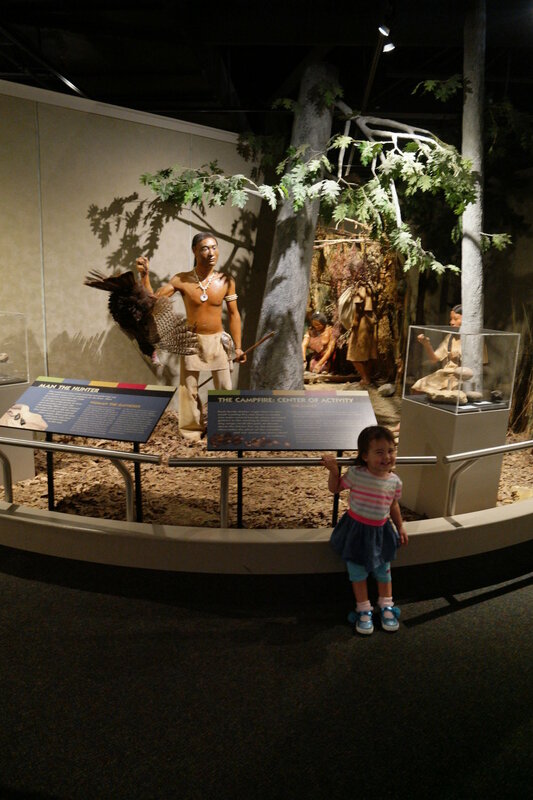 The museum offers a great overview of the daily life of Native Americans. It is a great way to introduce a history of Native American cultures to children. My kids really enjoyed the exhibits, which are excellent teaching resources. The picture above shows my girls considering how daily life played out, using an artistic recreation of the village at Fort Ancient. The museum has several galleries dedicated to understanding the archaeology and history of Native peoples. The museum also teaches how archaeological evidence is obtained. The historical galleries go in chronological order, up until the era of European contact. 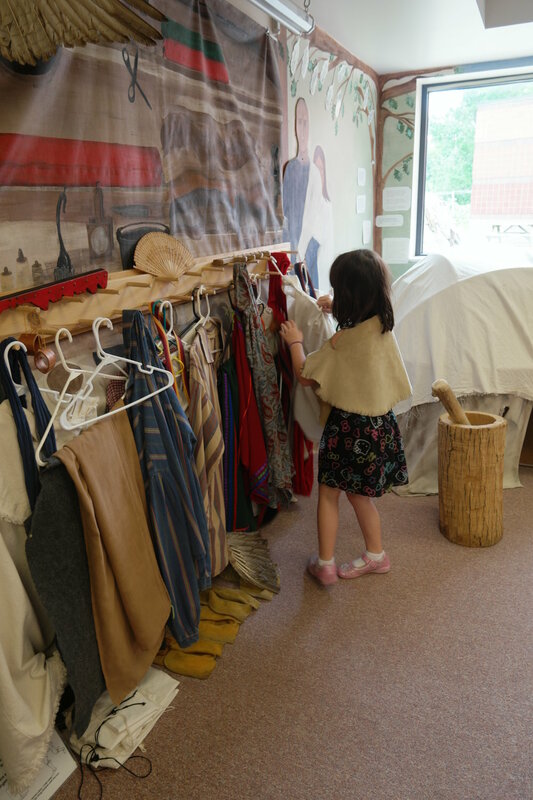 There is one section that serves as a learning center, where kids can play with instruments, touch common tools, and try on traditional clothing. I really appreciated a wall dedicated to a timeline (pictured below), which showed different aspects of everyday life according to time period. The gallery does an excellent job distinguishing the differences in lifestyle, while making it kid-friendly for all ages. This gave my children an understanding of the diversity of cultures over time. This gallery was appropriate for all ages. Even my two year old found it engaging, as she found some instruments to play with. Fort Ancient includes both a museum that gives a historical overview of Native cultures in America and the Earthworks, the prehistoric hill top enclosures. In addition, Fort Ancient has two sister sites in Dayton, including SunWatch Indian Village/Archaeological Park which brings to life Fort Ancient culture though a partial Village reconstruction and interpretive center (Fort Ancient website). The other is the Boonshoft Museum of Discovery. The Dayton Society of Natural History membership allows access to all these sites. On a final note, it is imperative that the public support the efforts to preserve these sites so they are not lost for future generations, by visiting or writing letters to congress in support for UNESCO consideration. The visit is definetly worth the time, and gives families with children a deeper understanding of Native American history.